While it’s alarming that what little sun we’ve had will shortly be ending, the autumn/winter season is fast approaching and, with it, a multitude of new and exciting shows at York Theatre Royal. The theatre has been entertaining audiences for over 250 years and has recently reopened after a major refurbishment. This year, it is set to host some amazing shows, from adaptations to hard-hitting productions. Among them, in co-production with Nottingham Playhouse, is Sara Pascoe’s Pride and Prejudice. Aiming to bring to life Austen’s immensely witty voice, the audience is warned not to be uptight about its disrespectful edge. The show will run from 4th Oct – 14th Oct.
Graham Greene’s Brighton Rock will also be gracing the stage from 16th Feb – 3rd Mar 2018 with a new adaptation by Bryony Lavery. The thrilling tale follows teenagers, Pinkie and Rose, as they find themselves in the centre of Brighton’s gang culture. For the younger family members, after its successful run of The Railway Children, The Studio is preparing for two more family friendly shows at the end of the year. From 28 Sep – 14 Oct, The Studio welcomes The Ugly Duckling, created in partnership with tutti frutti, and is bound to be a firm favourite with children aged 3 and up. For the festive season, audiences can enjoy E Nesbitt’s A Book of Dragons from director Juliet Forster. For the dragon-obsessed or a day out for the family, the dragons will be flying in from 12 Dec 2017 – 6 Jan 2018. The theatre will also continue its Of Woman Born work which explores the roles of women within the theatre industry. Of course, when the festive period arrives, so does the pantomime! This Christmas will be the year of Jack and the Beanstalk and the return of the beloved (and longest running consecutive) dame, Berwick Kaler. 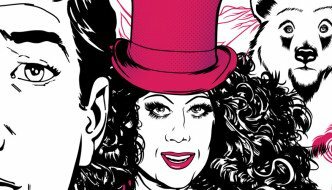 From 14 Dec 2017 – 3 Feb 2018, Berwick will be reunited with panto favourites, Marin Barrass, Suzy Cooper, A J Powell, and David Leonard as the classic tale becomes another memorable family favourite. Have you ever wondered what panto actors do when the season is over? 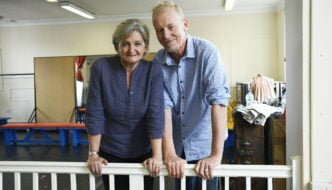 David Leonard and Suzy Cooper, stars of this year’s panto, will tell all in Waiting for Panto, with all proceeds of the one-night-only show (22 Oct) going to the theatre’s work with the community. Run entirely by a team of 12-26 year olds, the TakeOver Festival has been running since 2009 and every part of the festival, from producing to marketing, is managed by the team. The programme’s concept this year is Walls and looks to explore society’s idea of stigma and prejudice and how we are able to overcome them. From 21 Sep-23 Sep 2017, you can experience the exceptional performances from SLAP (Salacious. Live. Alternative. Performance. ), the artists and companies dreaming up out-of-the-box performance work for the people of York. The theatre will be presenting 600 People, What If I Told You?, Learning How to Die, and Castle Rock. The smash-hit musical Million Dollar Quartet rocks its way onto the stage from 19 Sep – 23 Sep after its success in the West End, Las Vegas and Broadway. Featuring classic hits like Walk the Line, Fever, and Blue Suede Shoes, the lively show tells of the night when Elvis Presley, Johnny Cash, Jerry Lee Lewis and Carl Perkins shared a space and recording session for the first and last time. The film was ranked as one of the top 100 scariest films and now the theatre production it’s on its way to York. From the author of Dial M Murder comes Wait Until Dark, a thrilling revival from the producers of Night Must Fall and Birdsong. The cast will include Coronation Street‘s Oliver Mellor and Prime Suspect‘s Jack Ellis. See it from 21 Nov – 25 Nov. If you’re looking for a tale of wealth and deceit, wrapped up in a Yorkshire town, the comedy For Love or Money comes to the theatre from 28 Nov – 02 Dec. The show is directed by Barrie Rutter, who also plays one of two questionable suitors, and the story has been adapted by Blake Morrison. Following its 2016 Australian and UK tour, York Theatre Royal will present Things I Know To Be True which follows the struggle of a family of six as the grown children work to define themselves and the peace and quiet of an empty home soon turns to a struggle of truths. The show will be a first for the theatre and will be bringing Frantic Assembly’s Tony and Olivier Award nominated Artistic Director Scott Graham and State Theatre Company’s Artistic Director Geordie Brookman together from 31 Oct – 4 Nov 2017. From 14 Nov – 18 Nov, you will be able to see Rita, Sue and Bob Too, a semi-autobiographical play written by Andrea Dunbar and directed by Max Stafford-Clark about two girls, and their fling with Bob, the father of the kids they are babysitting. A star-studded cast brings Miss Marple to York in A Murder is Announced from 17 Oct – 21 Oct. Like any good mystery, the twists and turns of a planned murder will keep the residents of Chipping Cleghorn on their toes. The cast also includes Eastenders‘ Janet Dibley, Doctors‘ Tom Butcher, Last Of The Summer Wine‘s Sarah Thomas, Waterloo Road‘s Dean Smith, and Coronation Street‘s Lucy Evans. Out of Character will present Objects of Terror from 1 Nov – 2 Nov, revealing the secrets behind Victorian lunatic asylums. Told by actors and artists who have all accessed mental health services, the performance is set to be both horrifying and spectacular. Lastly, from 17 Oct – 21 Oct The Studio will see Open Clasp and Live Theatre unite for Rattle Snake, a moving performance based on real life stories from women who have survived coercive controlling domestic abuse. Visit the York Theatre Royal website for further information and tickets.